Splash screen from HyperCard Eamon. HyperCard Eamon is a version of Eamon created by Whit Crowley for the Apple IIGS that leverages the interactive and hypermedia capabilities of Apple's HyperCard tool. Released in 1991, it consists of a primary stack for establishing player characteristics and a stack for the system's single adventure, a modified version of The Beginners Cave. 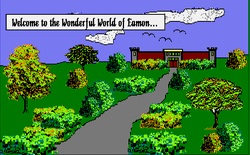 Adventure author Pat Hurst also wrote a HyperCard-based version of Eamon for the Apple Macintosh (noted by Tom Zuchowski), but it's unclear if it was completed or made publicly available.